Production process: Sand casting, Metal mold casting, Centrifugal casting. 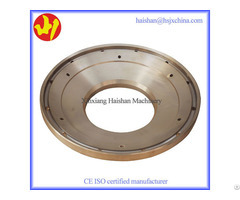 The model weight is from0.3kg/piece to 2, 900kg/piece. ZCuSn5Pb5Zn5(C83600), ZCuSn10P1, ZCuSn10Zn2(C90500), ZCuSn7P0.2, ZCuSn6Zn6Pb3, ZCuA19Fe4(C61900), ZCuA19Fe4Ni4Mn2(C95800), ZcuA11OFe3Mn2, ZCuPb10Sn10(C93700), C93200(SAE660), C95400. Cone Crusher middle of a large gear assembly is cone crusher spare part, moving cone axis interpolation, the smaller gap of about 3 mm, under a larger gap of about 8 mm, can be measured with a thick fuse assembly, socket liner abrasion and wear of moving cone sphere will affect the gap, moving cone trajectory by decision. After locking filler hole drilling broken, then the eccentric bushing upside down, you can remove the bushing. Before installing the new one, you must check whether or not the eccentric sleeve hole size has cracked. 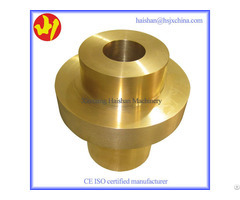 When installing copper eccentric bushing, it is available in dry ice cooling. 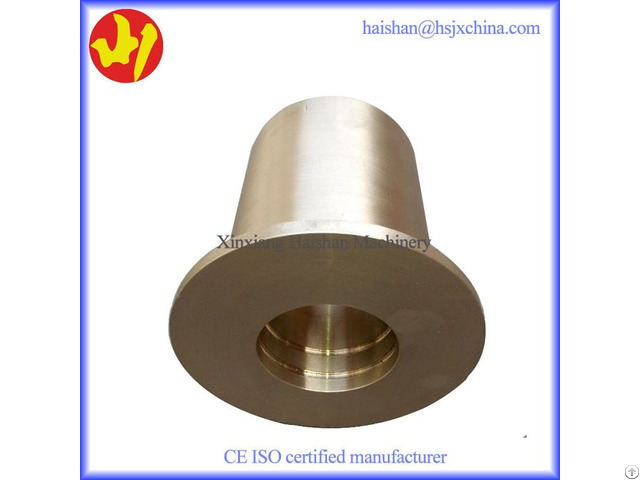 When pouring locking filler, eccentric and copper bushing must be at a temperature of about 70 degrees, eccentric and copper sleeve hole must be positive. Lower head bushing can be cut out, but make sure not to damage the moving cone bore. Upper head bushing can pull, and can be cooled with dry ice to speed up the pull-out speed. 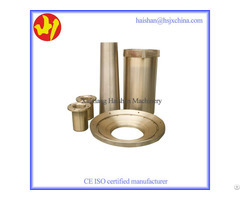 Dry ice can be used when installing copper cooling head bushing, at least 2 hours each, when fully cooled after, with its rings lift copper bushing, from under the rings to use flat gaskets to ensure dynamic cone copper sleeve edges and bottom edge parallel. When installing the countershaft bushing, use dry ice shrink at least two hours. After installation is completed, you need to install the top screws, screw fastening needs painted with a professional plastic.